On 28 March 1915, the SS Brussels was off the coast of the Netherlands when captain Fryatt came into contact with the German U-boat U33. He was ordered to stop, but realising the U-boat was about to torpedo his ship, he ordered full steam ahead and then tried to ram U-33, which then crash dived. For this action, Fryatt was awarded a gold watch by the Admiralty. On 25 June 1916, the SS Brussels left Holland bound for Harwich. On route she was captured by German destroyers. She was escorted into Zeebrugge and then on to Bruges. Captain Fryatt and his crew were sent to a civilian internment camp near Berlin. 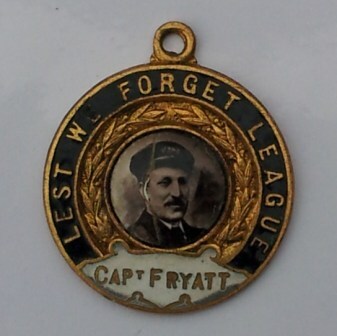 It was reported in the Dutch newspaper, that Captain Fryatt had been charged with sinking a German submarine. ( Although U 33 had not been sunk ) The basis for the charge was the inscription on the watch given to him by the Admiralty regarding the incident on the 28th of March early that year. The Court Martial was held at Bruges Town Hall on 27 July 1916. He was found guilty and sentenced to death. The sentence was confirmed by the Kaiser. At 19:00, Captain Fryatt was executed by firing squad and was buried in a small cemetery just outside Bruges. 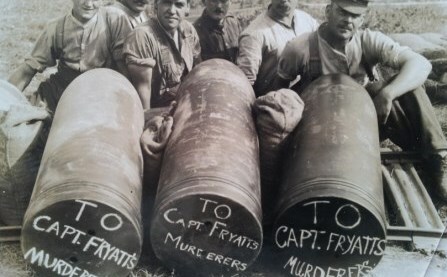 Captain Fryatt’s body was exhumed and returned to the United Kingdom. His funeral was held at St Paul’s Cathedral on the 8th July 1919. And was buried at All Saints’ Church, Upper Dovercourt. The Germans captured a British merchant ship in October 1915. On board they found a copy of orders that had been issued by Winston Churchill to captains of British merchant vessels. The orders stated that the crews of U-boats should be treated as criminals and not as prisoners of war. White flags were to be ignored. Survivors from U-boats should be shot if this was more convenient than taking them prisoner. This would explain the harshness of the Germans towards Captains of British merchant ships during the Great War.